We at English Wilton receive requests for historic hall and stair runners; at right is a beautiful c. 1900 pattern, fresh off the loom, and destined for a prominent house on New York's Long Island. 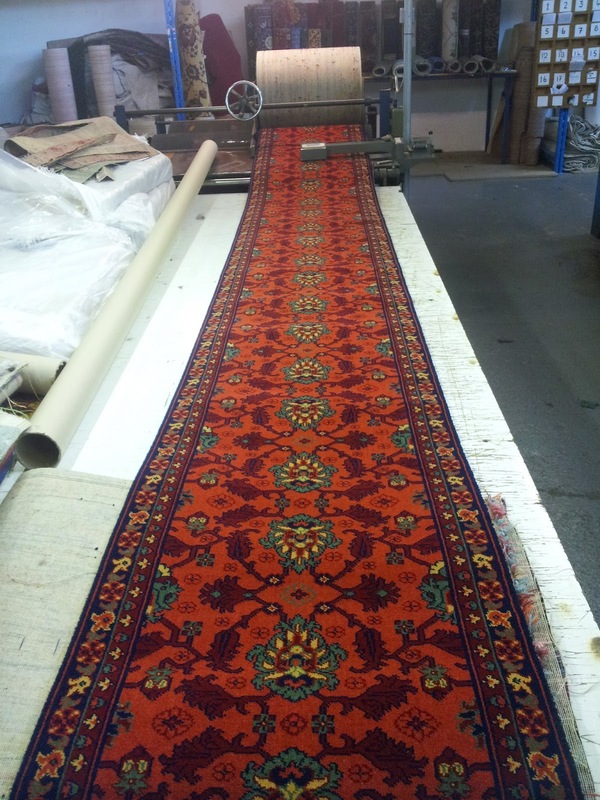 Since we weave to order, we must run at least 25 yards of carpet; this is typically enough for two staircases and a connecting hallway or a large landing. (A quick rule-of-thumb: each stair uses half a yard for the rise and run). Our decades of experience have taught us to specify the optimal grade of wool and density to create the most intricate pattern while producing a runner that can withstand the additional wear endured on stairs. Most of our runners, which date from 1790 through the 1950s were intended to be 27" wide, although there are 36" patterns available.